Started by metmike - April 12, 2019, 2:22 p.m. Some cold temperatures in the S.Plains this weekend giving the (HRW)wheat market a bit of a boost today as well as the potential for excessive rains for the SRW crop farther east. I see where temps in the panhandle are supposed to get as low as 23 degrees on Sunday Morning. 15% of the TX wheat crop is headed but I will guess the headed wheat will not have temps that cold but there probably will be some damage. 23 on heading wheat would be devastating. 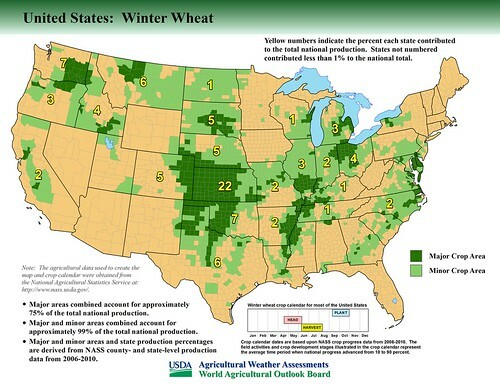 USDA crop condition report from Monday showing 15% of the wheat is headed in TX. Are you sure you want to delete this post: Wheat? By metmike - April 12, 2019, 2:25 p.m.
Are you sure you want to delete this post: Re: Wheat? By metmike - April 12, 2019, 2:28 p.m.
Are you sure you want to delete this post: Re: Re: Wheat? By metmike - April 12, 2019, 2:29 p.m.
Are you sure you want to delete this post: Re: Re: Re: Wheat? By metmike - April 13, 2019, 6:12 p.m.
Are you sure you want to delete this post: Re: Re: Re: Re: Wheat? By metmike - April 15, 2019, 7:07 p.m.
Winter wheat still 60% gd/ex vs 31% last year. Spring wheat planting falling behind. 2% vs 13% average. But last year was only 3%.